"You've never really been to Tawi Tawi until you've climbed Bud Bongao," so says our guide, Ben, as we set out on an overcast morning. It was a sentiment echoed by the staff of the local Tourism Council and it was easy to see why. While not particularly high at 397 meters according to my buddy's GPS (314 according to references), Mt. Bongao stands imposingly, visible from any point in town as if guarding it from harm. We took a short tricycle ride to the jump-off in Pasiagan, lugging bunches of bananas.F rom the beginning, the trail was slippery from consecutive days of start-stop-start rainfall during the afternoons.T he 1.5-2 hour long climb is described in the reference books as hot and dry during the summer months. But now, it's hot and humid as we made our way through the thick forest cover. Past midway, the trees rustle even though there was little wind. Then, the shrieks came - guttural and insistent. The leaves part and reveal the macaques, expecting us to give them their fill of bananas to which we happily oblige. Pretty soon, the air is filled with their grunts. The monkeys are considered sacred by the locals, superstition dictates that those who touch or harm them awaits misfortune. The higher we climbed, the less boisterous they become which is well and good as we quickly ran out of bananas. On the first clearing, we found the first of three tampats or holy resting places. An imam awaits sojourners here like the families who followed us on the trail. 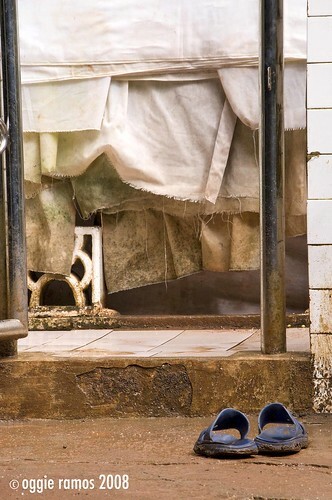 They take off their slippers before entering the tampat. One parent bears a sick daughter, bidding the imam to give a blessing and summoning the mountain for healing. On the way back down, Ben points out many branches knotted with all sorts of tying materials -- plastic wrappers, twine, branches. these are sort of "prayer" or "wish" knots as sojourners pray and make a wish then bind this with a knot. no one dares remove any of the knots for fear of retribution or worse, becoming the cause of a wish to go unfulfilled. I must've tied several knots with branches before we continued our descent and enjoying the vantage point afforded by the elevation. 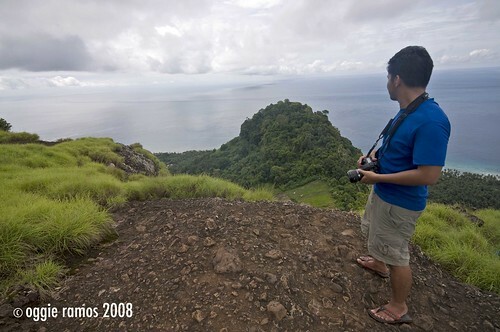 It's a heady feeling to survey Tawi Tawi from this high, even headier to feel the mountain's energy course through our beings. while reading we were like with you oggie. i already miss hiking, the summit view and the experience. the wish knots are really interesting. if ever you go to basilan, i recommend that you hike up monte santo. it's in between isabela and lamitan. it's safe in that area. another interesting mountain there just beside it is mount ubit. jaki, these are very similar to the prayer locks in china i guess. i initially thought they were trail signs or plain trash kaya it's a good thing our guide told us the story behind them. dom, thanks bro. will look these up if and when i get to visit basilan. photo cache, dami talagang pwede pang puntahan. will always be glad to share them with you. thanks for being a very regular visitor here. pao, there are really places na parang source of palpable energy and mountains are among them. it could be the ions but i'd rather subscribe to the romantic notion that mountains are closer to heaven kasi. bai, sinabi mo pa. superkulit yung mga macaques. pag napaginitan ka pa, pwede kang kagatin kaya we steered clear of them. so malamang, nag-wish kayo ni Ferdz? hehe. it's really a different kind of high when you're on top. kakaibang perspektibo ang makikita. amigo, onga eh. i think mabait naman tayo kaya the monkeys steered clear of us, hahaha. grabe, ubos kaagad yung bananas. plastic as prayer knots? hmmm! parang sa everest no? prayer flags. 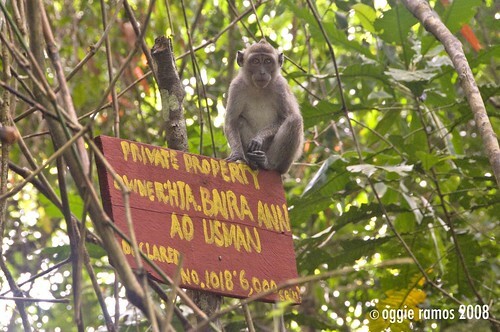 the monkeys are really something that makes the trip up bongao peak memorable. the good thing about it is that once you ran out of bananas, di naman sila nangungulit pero susundan ka hanggang taas. nandun pa ba yung sacred burial sites sa 3 points? the view from above is really worth the trip. bad trip lang nung pumunta ako since yung guide ko nagmamadali. How is the peace and order situation there? bert, tawi tawi is a picture of peace when we visited. nadadamay lang siya when the nearby islands like sulu and basilan are in the news.